As humankind restores ways for prosperously living in the countryside, part of that effort involves restoring rural traditions that attract visitors to their community or individual farms to boost farm income and the local economy. Many are familiar with how rural communities are uniting to put on autumn harvest festivals with farm tours, corn mazes and pumpkin decorating demonstrations. But some small scale farmers and rural communities are also looking for a springtime rural tradition to boost exposure and revenue, and they’re finding it with the Easter through May Day holidays. Farmers can draw customers to their farms with spring agritourism if they simply hold a single tour in the spring -- such as a grassfed seasonal dairy giving tours -- or attract extra attention to their spring CSA sign-up with a springtime farm tour. But they can also provide a much larger spring festival similar in scope to the large autumn harvest farm festivals that dot the countryside in fall. Spoutwood Farm started out celebrating May Day as a casual event, and the festival turned into one that attracted thousands of paying guests. Rob and Lucy Wood , the owners of Spoutwood Farm in Glen Rock, Pennsylvania, operate the small acreage farm. It includes a sustainable CSA (community supported agriculture) at one time feeding 100 families from just three of their acres, and other farm and nature projects, including educational programs on farming and gardening. It was their affinity for Celtic tradition and folklore that helped them choose May Day with a strong Celtic twist as a theme for that initial private party for about a hundred friends. It became so popular, it grew from a one-day private gathering to a three-day festival attracting close to 15,000 paying visitors. Vendors and performers were added, and people from other states now come to enjoy the yearly countryside event. At this writing, admission was $15 for adults, $5 for kids with ages two and under attending for free. They allow a certain number of people to request a 2-hour volunteer job assignment and upon completion, can have their admission fee refunded. May Day activities for this spring festival as an agritourism event include a May dance, making and delivering May baskets (baskets filled with fresh cut flowers), a May feast of some sort, and other activities involving flowers. 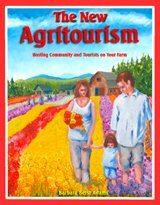 For those new to the term agritourism, it's a method for farmers or rural communities to supply agricultural and traditional cultural education and entertainment to visitors in a manner that also helps their bottom line. When they put on festivals which are free to the public rather than charging an entry fee, it usually means the farmer or community has plenty of on-farm items to sell to the visitors to help make the project financially viable. The event, in other words, is a customer draw for making money on the small farms. Sometimes fees are charged for the events, such as with Spoutwood Farm, meaning the fees themselves are a source of revenue along with the positive exposure the farm receives in order to attract and keep loyal customers. Today, for the farm that sells spring crops or is involved in agritourism such as farm B&Bs, an on-farm May Day celebration can be a huge media attraction and customer draw. We held our May Day celebration partly on our farm, but mostly up the road where there was an historical one-room rural schoolhouse. It drew media and public attention from 150 miles away. - Host a day of making May Baskets, especially if your farm sells April and May blooming cut flowers. Many people don’t know how to make simple May baskets anymore. - Hold a flower arranging party for either children, adults, or both. 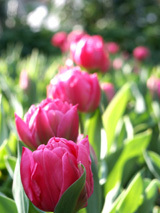 A flower farm may even want to invite a professional to demonstrate ways to arrange flowers. Or, volunteers may want to just gather a group of kids to show them the basics of the art. It can be fun to collect or purchase unbreakable, whimsical flower vase containers at flea markets or craft and discount stores. Look for interesting old shoes, buckets, straw hats, old cooking pots, and deep wooden bowls. Provide floral foam and a way to waterproof the container if necessary, such as by inserting recyclable plastic florist containers. Show how to soak the foam first and stuff it into the containers. The resulting arrangements can be gathered together for a group photo and art gallery type of display, then either taken home by the creators or become part of their May Baskets meant for delivery.